The Blastrac BMP-265E scarifier is powered by an electric motor and is ideal for medium and large sized applications. The BMP-265E benefits from an ergonomic design, the braking system with a steer handle will slow down the machine itself. For a user friendly high performance scarifying machine. The BMP-265E scarifier is almost dust free when connected to the appropriate Blastrac dust collection system. Blastrac has designed a full range of scarifiers and cutters, which give the opportunity to process any floor and specific application. The 2-30DTM is a smaller version of the 2-45DTM and is the third ride-on shot blasting unit developed by Blastrac. Blasting capacity: up to 3000 m2/h | This machine is a completely self-contained shot blaster ideal to regenerate the macro and micro texture of road and runway surfaces. The 1-10DPS75 shot blasting machine is a reliable machine provided with latest technology and appropriate for many jobsite sizes. The Blastrac 1-10DS blast-cleaning machine offers a high level of versatility for any size job site, its heavy duty blasting ability makes it ideal for medium to large sized surface preparation applications. The Blastrac 1-15DS blast-cleaning machine offers a high level of versatility for any size job site, its heavy duty blasting ability makes it ideal for large sized surface preparation applications. The 2-20DT is a powerful shot blasting machine equipped with 2 twin motors 11kW and still fit to a standard door entrance. The Blastrac 2-48DS is the biggest shot blasting machine of our range. It is ideal for heavy duty work with its 2 powerful blast motors. Working width: Ø435 mm | The BMG-435WD is our smallest planetary triple head grinder. This floor grinder / polisher is perfect for confined areas. Working width: Ø435 mm | The Blastrac BMG-435P is the smallest and the only three headed grinder in our range with a petrol motor. Working width: Ø535 mm | The BMG-535PRO is a medium sized triple head grinder. There is no risk of underground deterioration and it can work in places with high hygiene and safety standards. 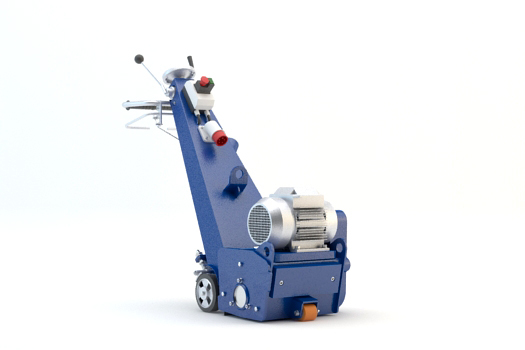 Working width: Ø580 mm | The BMG-580PRO is a medium sized triple head grinder with 3 planetary rotating discs Ø185 mm. It has a LCD screen for all required information. Working width: Ø780 mm | The BMG-780PRO MKII is a triple head grinder with 3, Ø240 mm planetary rotating discs. It's an user friendly machine and comfortable to use with low vibration. Working width: Ø780 mm | The BMG-780RS is a remote controlled grinder which makes the machine very effective and ergonomic to operate.